The in-build 54 metre Newcastle Marine explorer yacht Ulucitcan (ex-Chuggaboom) has been pictured leaving Florida, bound for Genoa. The first details of this project were revealed in 2011, but construction was put on hold when Newcastle Marine ran into financial difficulties. However, these new images suggest that a new European build partner has been found to complete the job. 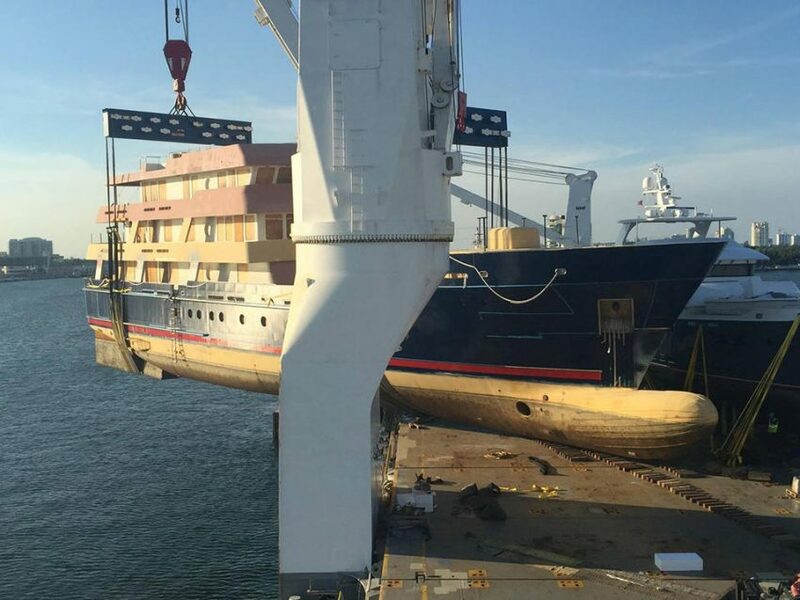 Shipping firm United Yacht Transport described the 650-tonne Ulucitcan as “the heaviest yacht any carrier has deck-loaded in years”. This four-deck explorer yacht was developed in collaboration with Dutch naval architecture firm Vripack, while British studio Winch has designed an interior that has been described as “luxurious and well-balanced”, as well as the exterior deck spaces. Speaking back in 2012, Marnix Hoekstra from Vripack described the design as “a man’s boat – chunky, rigid and really able to withstand the elements”. Another unusual feature of this explorer yacht is the workshop and storage space for five or six motorbikes on the main deck, which opens onto the boat deck. This would allow for easy loading and unloading — ideal for on-shore exploration. Built from a steel hull and aluminium superstructure, Ulucitcan features a twin-screw diesel propulsion system that should allow for efficient long-range cruising at 12 knots.